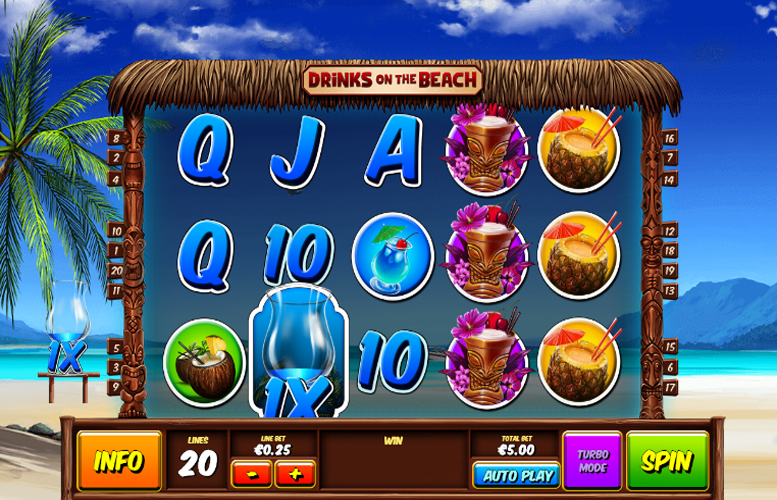 Drinks on the Beach is a colourful and easy-going slot machine from Playtech. It’s bright and summery design will appeal to many and instantly brings a thirst that only an ice-cold cocktail served in a coconut or pineapple could quench. Fortunately, there are plenty of those on this title! The title features some innovative gameplay features that can result in some decent pay-outs. These include a multiplier mode that can increase any wins by a factor of 10 and a massive random “wild” feature. Unfortunately, the game lacks a true second screen bonus round. This somewhat limits the replay value and those slot veterans out there might find it gets old rather quickly. A couple of innovative bonus rounds. We particularly like the increasing multipliers on the free re-spins. Decent main game prizes and upper betting limit. They aren’t the largest around but are easily large enough for all but the choosiest players. Colourful design makes the game visually appealing. Not a huge amount of variety. 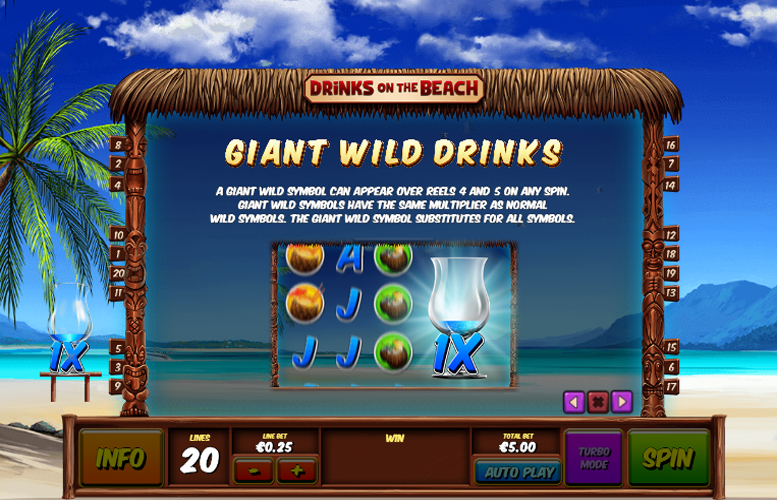 With just two bonus features, players would be forgiven for getting bored of Drinks on the Beach rather more quickly that with more action-packed slot machines. It feels a little stingy for additional reels to not be covered by the giant “wild” symbol. Granted this would mess with the title’s RTP but would certainly increase the ethe line betitement factor for players. Purple Cocktail= 1,000x the line bet. Red Cocktail or Yellow Cocktail = 500x the line bet. Green Cocktail or Blue Cocktail = 250x the line bet. 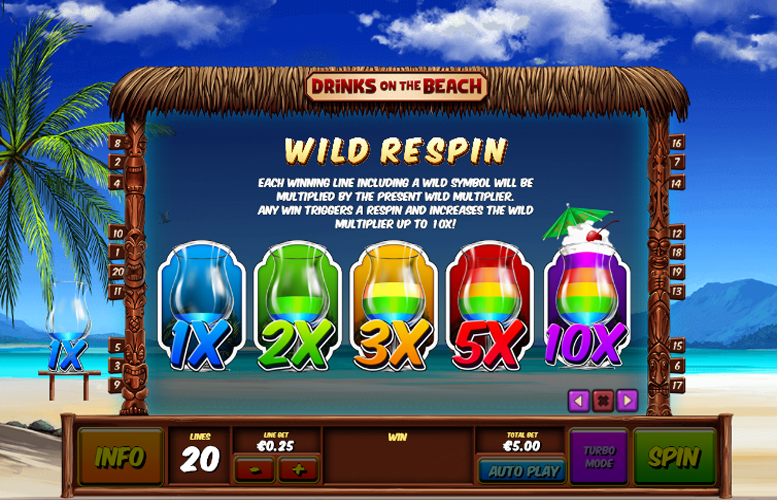 During this feature, each winning combination that includes a “wild” symbol will be multiplied by the present “wild” multiplier. Any win will trigger a re-spin and this will increase the “wild” multiplier up to a mighty 10x. There are a total of five different multipliers to work through before the largest becomes active (1x, 2x, 3x, 5x, 10x). A giant “wild” symbol can appear over reels four and five on any spin. It will show up at random during a spin. The giant “wild” symbols have the same multiplier as the normal “wild” symbols and can also substitute for any of the other symbols. 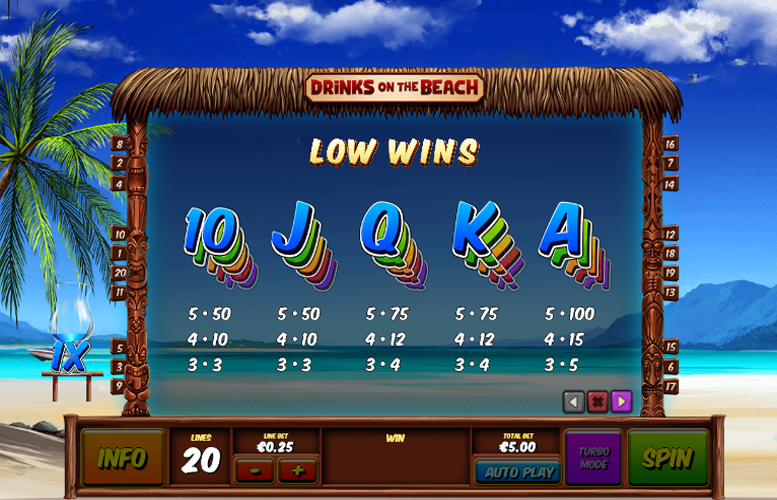 Unfortunately, being as they only appear on the end two reels, the chances of hitting a truly massive win with the feature are greatly reduced. In terms of betting limits, players are only able to adjust the amount bet per line. This is because the number of lines is fixed at 20. The minimum line bet possible is just 1p. This makes every spin cost just 20p. Meanwhile, the maximum line bet is £25. This makes for a maximum bet per spin of £500 – more than enough for all but the very highest rollers. 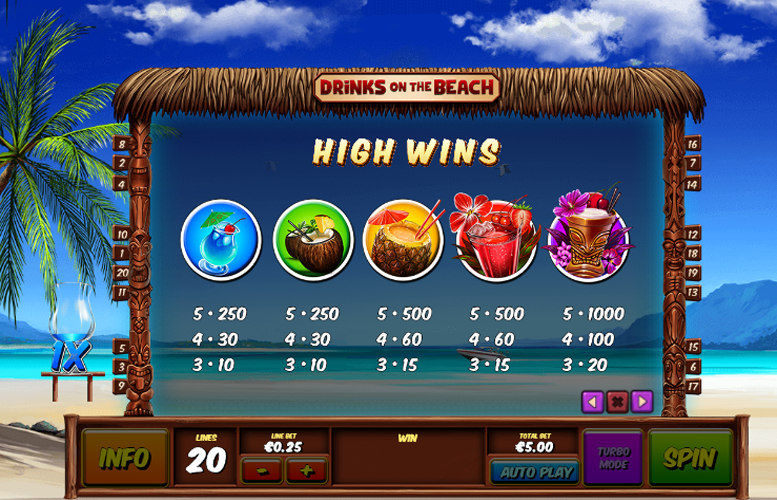 Considered in its entirety, Drinks on the Beach is a decent offering from Playtech. It might lack in the gameplay dynamics department, but it makes up for in its simplicity and visual appeal. The main game prizes and the upper betting limit are sizeable enough for all but the pickiest players and it offers some particularly lucrative bonus features. We just love any game that offers 10x multipliers. That said, the title is somewhat let down by its lack of variety when it comes to bonuses. The omission of a true second screen game feels like a missed opportunity. This is unfortunate as the inclusion of even a free spin mode would greatly improve the replay value of Drinks on the Beach. This game has a rating of 8 / 5 with 389 total reviews by the users.